When I started this book I thought to myself 'there's no way I'm going to finish this' because I thought the writing was a bit cringe-worthy. The thing at the beginning? When she compares some boy's blue hair to the tentacles of an octopus? Oh god, not a good start. And then I don't know what happened, I was so drawn into the story and the characters that I didn't care so much about the bad similes. And I finished the book in just over a day. I can't stop thinking about this book, thinking about reading the next two books. I want to know what happens. And I want to know now! So for me, it's very reminiscent of Twilight. Obviously not written brilliantly, but the storyline is interesting enough to propel a reader through the worst of it. I applaud Cassandra Clare for her romantic scenes and for the fact that there is definately enough action scenes to balance out the mush. 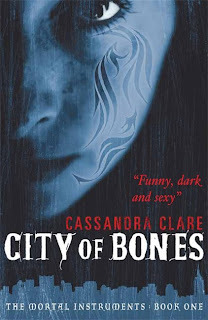 Clary Fray and her best friend, Simon witness a murder at a nightclub and from there they uncover this secret world where she meets Jace, Isabelle and Alec, Shadowhunters who live in this uneasy balance with demons and faeries, werewolves, vampires. Then Clary's mother disappears and with the help of her new friends, Clary goes in search of answers and a Mortal Cup to save her mother and to stop the bad guy. It was a fun read, definately. Bring on the sequels. Sounds like a fun, imaginative read. It's always nice when a book exceeds expectations (especially when it's the first in a series). Lucky you! It is contagious isn't it? Can't wait to read the second one. Wow, that is a very different cover for this book than I have seen previously! Kailana - You've seen the American cover? I thought it was horrendous. This one's very shiny. Scrap girl - yes, but I'm not in love with the series. Not yet anyway. One of the plotlines has already been spoilt for me so I'm giving the series a bit of time before I go back to it all.